Special thanks to Royale Chulan Penang for extending this food review invitation. Sri Tanjung Cafe is one of the few restaurants in Royale Chulan Penang; the others are The Spice, Tea Room and Heritage Lounge. Sri Tanjung Cafe occupies the ground floor of the Boustead Building, which is a historical structure that has existed for more than a century. The Sunday High Tea at Sri Tanjung Cafe has been revamped recently with a number of new dishes. 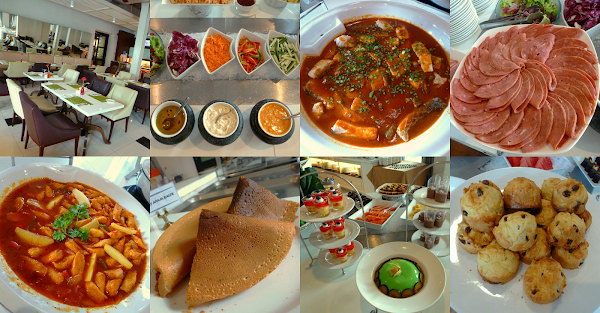 Although called high tea, the buffet also covers a substantial number of cooked dishes. For cold cuts, the restaurant prepares delectable slices of smoked duck and beef pepperoni. The salad bar presents local favorites like Kerabu Ayam Berempah (spicy chicken salad), Jellyfish Kerabu, Asian Coleslaw, Mango & Papaya Salad and Tauhu Sumbat (stuffed tofu). Should diners prefer to mix their own salad, there are mesclun salad, radicchio, bell peppers, carrot, cucumber and cherry tomatoes. Also prepared are 3 types of salad dressing: mayonnaise, Thousand Island dressing and olive oil. Fruit Rojak comprises of cut fruits such as mango, guava and cucumber. The fruit cubes are dressed in thick rojak sauce to produce sweet-savory taste. Meanwhile, Pasembur is particularly popular in Penang especially among the Indian-Muslim community. Its main ingredients are prawn fritters, boiled eggs, potatoes, tofu, julienned jicama (sengkuang) and cucumber. Sweet peanut sauce, similar to the one for satay, is used as dressing. Jetty Apam Balik is one of Penang's most popular street snacks. Cooked in a small metal pan, the crêpe is made from flour batter and is filled with brown sugar, crushed peanuts and creamed corn. When cooked, the snack is folded over like a taco. The thin crêpe is best enjoyed while it is hot. If left to cool, the shell loses its crispiness and becomes too soggy. Another crowd favorite is Roti Jala. This web-like snack is made by drizzling liquid batter on a hot griddle using a special utensil. Roti Jala is typically served with chicken curry. Other local street snacks are Pisang Goreng (banana fritters), Peanut Butter Waffles and Popiah Basah. Koay Teow Th'ng (粿条汤) uses clear soup that is derived from chicken stock. Besides flat rice noodle, the soup is also served with shredded chicken, fish balls, fish cake, choy sum (菜心) and bean sprouts. 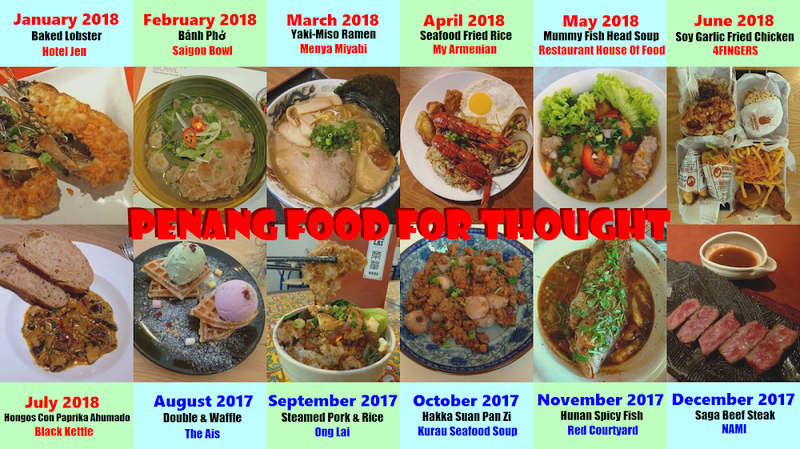 Besides Koay Teow Th'ng, another noodle dish that is prepared today is Laksa Penang. Roasted Duck is best known for its browned skin that is waxy and crispy. Orange ginger sauce is used as condiment, but I personally prefer to dip in plum sauce. Char Koay Teow (炒粿条) is also served today. Steamed Fish Fillet is cooked with spicy-savory Nyonya sauce. I highly recommend trying this dish. In addition, there is also a squid dish that uses a similar gravy. Lamb Vindaloo is an Indian curry dish that packs a respectable punch of spicy flavors. Also originating in the subcontinent is Chicken Tandoori, where chicken is marinated in yogurt and spice mix, and then roasted in a clay oven called tandoor. Other cooked dishes on the buffet line are Stir-Fried BBQ Sausage, Steamed Chicken Feet, Seafood Dumplings, Golden Tofu and Seasonal Vegetables. As for carbohydrates, Nasi Goreng Ikan Masin is the rice dish for today. Fried Tang Hoon uses translucent noodle that is made from mung bean starch. Some people especially the elderly will find comfort in Chicken Porridge with condiments. Spaghetti Arrabbiata is the pasta dish today. "Arrabbiata" means "angry" In Italian. This refers to the spiciness of the sauce, which is made from red chili peppers, tomato, garlic and olive oil. The pasta and sauce are kept separated to prevent the former from becoming too soggy. Scone is an essential element of high tea. These fluffy pieces of leavened cake are customarily eaten with jam and cream. Meanwhile, butter and chocolate cookies are sealed in jars to maintain their freshness. The cookies are highly addictive, so go easy on them. Finger Sandwiches are white bread with tuna filling. These mini sandwiches are customarily eaten in the afternoon to suppress hunger before dinner. Some of the hotel's signature desserts, Chocolate Mousse and Assorted Fruit Jelly, are served in small cups. Fruit Pudding, Crème Caramel and Sago Gula Melaka are particularly tempting to diners who have a sweet tooth. Today's Western pastries include chocolate butter cake, marble cake, brownies and fruit tartlets. On the side are cut tropical fruits, namely papaya, pineapple and watermelon. One of my favorite desserts is Pengat Pisang. The sweet soup contains soft slices of banana and miniature sago pearls. Finally, Ice Kacang is a shaved ice dessert with sweet toppings such as attap chee (nipa palm fruits), kidney beans, grass jelly, green jelly noodle, crushed peanuts and creamed corn. Coconut milk, gula melaka (palm sugar) and rose syrup are drizzled on top to provide sweetness and aesthetic appeal. 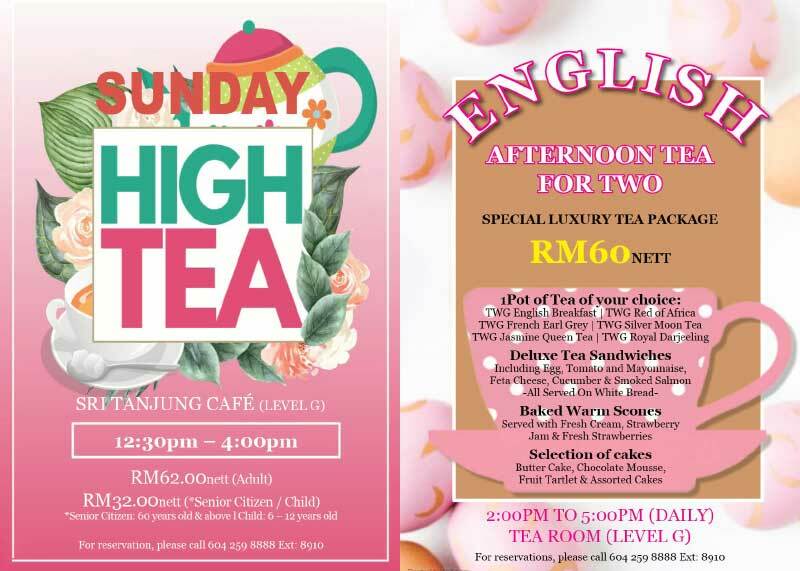 The Sunday High Tea at Sri Tanjung Cafe is served from 12:30pm to 4:00pm every Sunday. 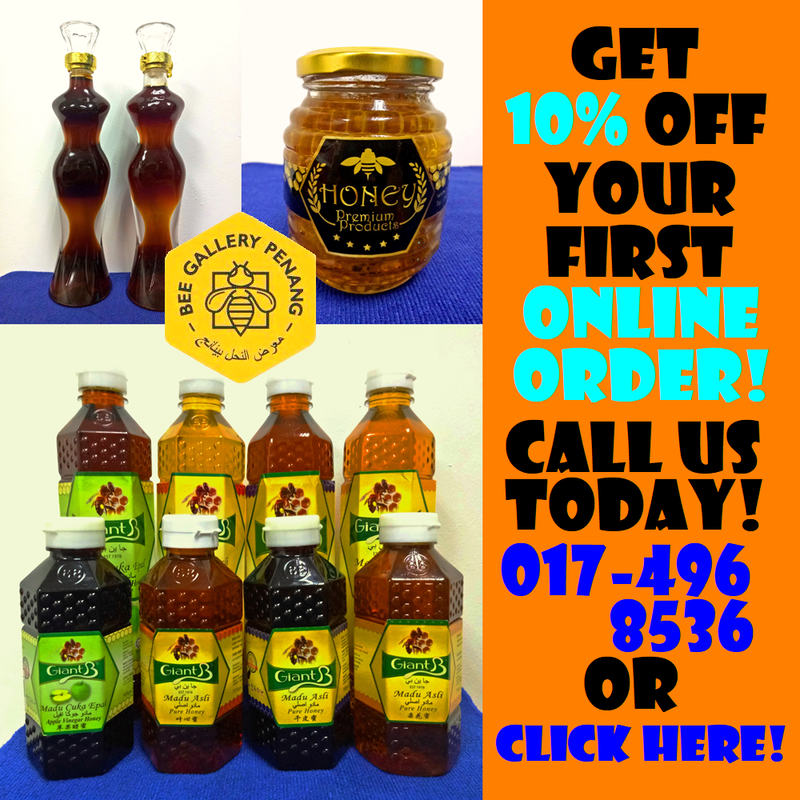 The price is RM62.00 net per adult, and RM32.00 net per child or senior citizen. Hotel guests enjoy 20% discount. Directions: From the ferry terminal at George Town, turn right and drive along Weld Quay (Pengkalan Weld). Royale Chulan Penang is located shortly on the left, at the same block as Via Pre and Made in Penang Interactive 3D Museum. There is a small lane right after the hotel, which leads to the main entrance and multi-level car park. Guests who dine in Sri Tanjung Cafe can get their parking tickets validated for a flat rate of RM5.00 per entry.